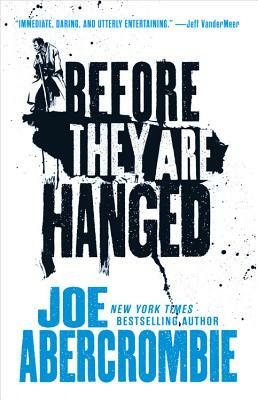 Before They Are Hanged (The First Law Trilogy #2) (Paperback) | Tampa's only full service INDEPENDENT bookstore. Superior Glokta has a problem. How do you defend a city surrounded by enemies and riddled with traitors, when your allies can by no means be trusted, and your predecessor vanished without a trace? It's enough to make a torturer want to run -- if he could even walk without a stick. Northmen have spilled over the border of Angland and are spreading fire and death across the frozen country. Crown Prince Ladisla is poised to drive them back and win undying glory. There is only one problem -- he commands the worst-armed, worst-trained, worst-led army in the world. And Bayaz, the First of the Magi, is leading a party of bold adventurers on a perilous mission through the ruins of the past. The most hated woman in the South, the most feared man in the North, and the most selfish boy in the Union make a strange alliance, but a deadly one. They might even stand a chance of saving mankind from the Eaters -- if they didn't hate each other quite so much. Ancient secrets will be uncovered. Bloody battles will be won and lost. Bitter enemies will be forgiven -- but not before they are hanged.